Make the ragu; sweat the garlic, onions, celery and carrot in a little oil and a large pinch of salt. Increase the heat, add the beef and bay leaf and cook until browned. Add the tinned tomatoes and simmer for 90 minutes. Using a spiralizer, shred the courgettes. 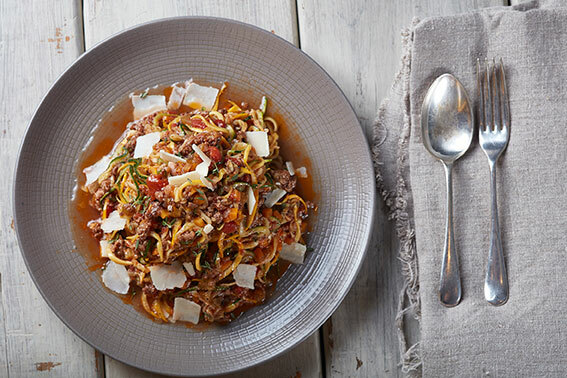 When the ragu is ready, place the courgette spaghetti in a bowl and mix through the hot ragu. Portion into bowls and top with fresh parmesan and some fresh oregano leaves.